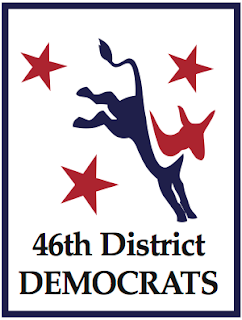 The 46th District Democrats have selected a new day for their regular meetings, starting this month. They have been working for several months on finding a new day and week of the month to hold their regular monthly meeting, to reduce conflicts with evening civic committee meetings in all three of their district cities. We have found a date with many fewer conflicts – the third Wednesday of each month. So, we move to the third Wednesday starting on June 20th at 7:00pm. Regular meetings will continue to be at the Mennonite Church Auditorium in Lake City, as that location is comfortable and has good transit options. The regularly scheduled District Meeting will be Wednesday, June 20th, at 7:00pm, at the Seattle Mennonite Church Auditorium, located at 3120 NE 125th St, in Lake City.